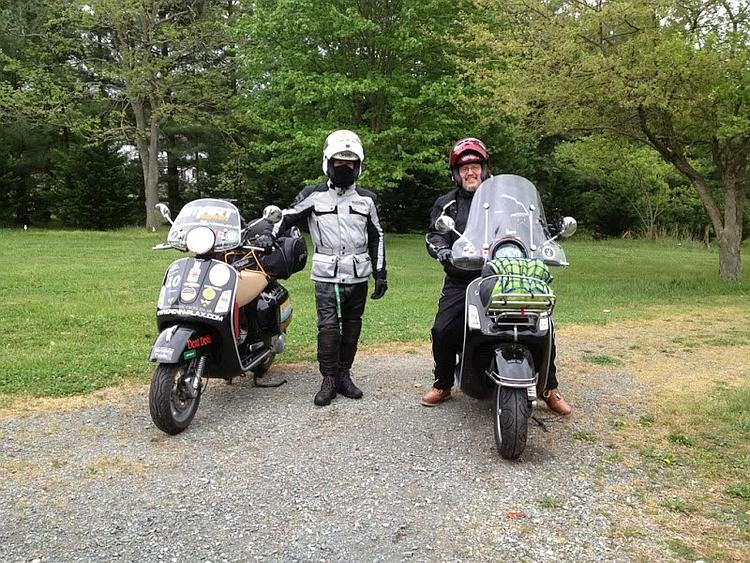 When someone invites you to do a coast-to-coast rally across the United States, riding a scooter isn't the first thing that crosses your mind. 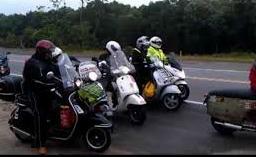 In mid-2010 I was invited by the organizers of the Scooter Cannonball Run to do exactly that. I couldn't find a good reason not to so over the course of the next 18 months I set about organizing a scooter, finding a team-mate and generating the funding needed to compete. I also decided that if someone other than me was going to benefit from this stupid act, it may as well be a local charity that is very close to my heart - the Mid Kent Breast Cancer Research Appeal. I work in the automotive industry so I spent the time badgering companies and friends for sponsorship. My team-mate was located through a scooter forum to share the costs of hotels, support truck, etc. 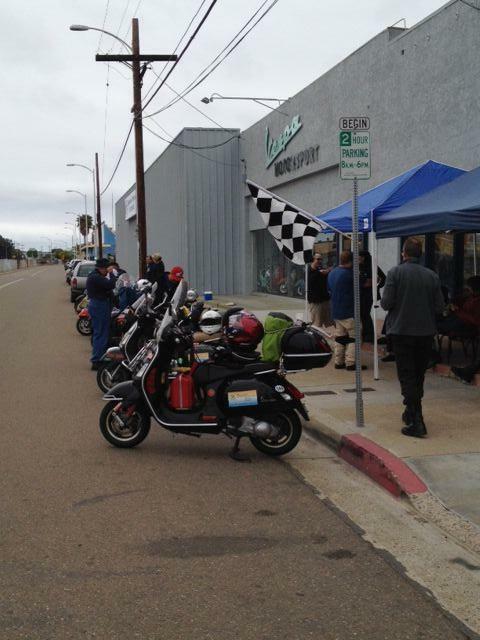 I'd done a deal with a Vespa dealership in LA (the most successful dealership in the US), who wanted to promote their business. 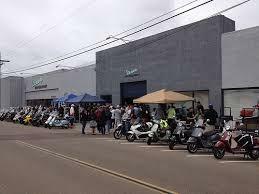 Showing their customers that a Vespa scooter could be ridden at full chat from one coast to the other would be great for business. From London I flew to Dulles airport in Washington. My team-mate Rick collected me and within minutes we were laughing like we'd known each other for years. 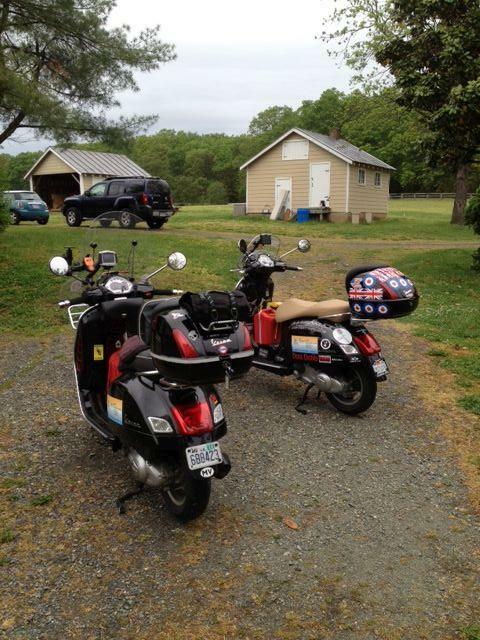 The next day was spent applying sponsor's decals to the scooter and loading it up for the ride to Waynesborough, Virginia, where we hooked up with six other Cannonballers. From there, we made our way along the Blue Ridge Parkway to Hickory, North Carolina, where we spent the night. Frustrated with the other riders' habit of stopping for ciggies and shopping every 45 minutes, Rick and I broke away from the pack and left them to it. The next morning we hit the superslab to Savannah, Georgia and the starting line. Here we waited for 48 more riders and support crew to turn up. We stayed at the Thunderbird Inn, a true piece of Americana where rock and roll music is played over the car park sound system 24/7. We sat and relaxed with a cool drink while we watched the other Cannonballers arrive from all over the US. The night before the start was spent welding, tweaking, and rebuilding (for the vintage riders) and kicking back with a drink (for the modern riders). Day 1 started in Savannah Old Town by the riverside, in pitch darkness at 6am in the rain. After a quick pep talk by the organizer it was engines on and off we went. Within minutes a GT200 had gone down on the wet cobblestones. I couldn't figure out why the roads were so quiet until I figured out that everyone was in church - there's one about every two miles. It wasn't long before we encountered some very interesting obstacles in the road. I shouted "dog" and Rick replied "Forget the dog - look out for the turtle!" I swerved to avoid a snapping turtle in the road that took up a third of the lane. Behind us a Burgman 400 went off the road and crashed into a road sign, opening up his ankle and needing 78 stitches. After a 328 mile day, we finished in Troy, Alabama. This was when I first noticed a small white dot on my left hand, near my little finger. Thinking it was just a spot I gave it a squeeze and thought nothing more of it. The most remarkable and sad thing about this otherwise uneventful leg of the ride was the number of abandoned houses, businesses, and shops along the way. We also noted a very interesting use of cars as garden ornaments. Social status was directly linked to the number of school buses you had in your back yard. At the beginning of the day one rider (who had turned up without a satnav) decided that Rick and I would make good riding buddies. It wasn't long before he had thoroughly pissed us off with his "proximity issues", so we devised a cunning plan to ditch him early the next morning. Agreeing to leave at 6am we made plans to leave at 5:30. All was going smoothly on this leg of the journey until we encountered a three mile section of roadworks where the tarmac had been ploughed into furrows that had an interesting effect on the steering. Not much fun with 12” wheels. We survived that without incident, only to find ourselves held up by logging trucks. These not only take ages to overtake, they have hulking great logs poking out the back apparently held down with nothing more than a few lengths of rope. Our finishing point was easily the worst hotel in Lufkin - so bad in fact that quite a few riders chose to decamp to a chain hotel (which turned out was used as a headquarters by the town's prostitute colony). We stuck it out, bugs, smelly carpet, and all. 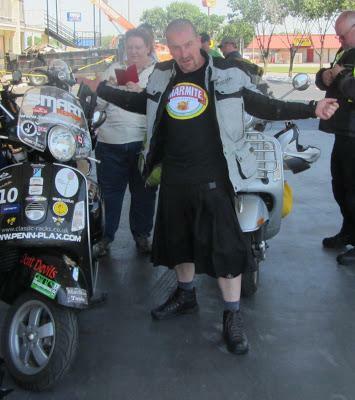 On a bet with a sponsor from Israel, I'd agreed to ride this leg of the journey in a kilt. Suitably attired in lycra shorts and knee pads I set out in balmy temperatures only to arrive in Abilene in 103 degrees. Unfortunately the GTS 300's radiators are ideally situated to deliver a blast of hot air all over your lower legs. By the time we arrived at Abilene I was well and truly cooked. Thankfully there was a Texas BBQ waiting for us, along with the local television station - who insisted that I do a few laps of the parking lot in my kilt. They did a little spot on us for the evening news. Over the past few days the spot on my hand had grown in size and virulence, and my hand had taken on the appearance of an inflated marigold glove. It was becoming very painful. We awoke at 4am and left Abilene in the darkness to ride in the desert with nothing but a headlight and a satnav to guide us. I've always enjoyed riding in the dark so I was in my element. Lesser so my team mate, who rapidly dwindled to a tiny dot of light behind me. As the sun rose to our right it cast long shadows onto the road in front of us. We stopped on a couple of occasions just to appreciate the view. It was a long and uninteresting straight into Roswell - Texas had seemed to go on forever. When I arrived in Roswell I found a pharmacy and was given antihistamines for what we suspected was a spider bite. There's not a lot say about this leg of the journey except that it was surprisingly cold and surprisingly green. At the end of the ride we found ourselves shivering underneath our jackets. I finally caved and set off in search of a doctor. Because I was still cold from the ride I could barely write my own name on the forms and must have looked like a crack addict. They confirmed the diagnosis of a spider bite and I was given antibiotics. My hand had swollen so much by this point that I couldn't get it into my glove any more, so on the way back to the hotel I stopped off at a hardware store and bought a pair of cotton work gloves to accommodate my now badly swollen mitt. That evening, a masseur turned up and gave many of us a relaxing rubdown. We had climbed up to 7023 feet by this point on the way to a town in the hills called Jerome, which looks like something out of a spaghetti western. The nav went a bit crazy because the roads were so narrow and sent us around in circles for a while. After we left Jerome our navs, even though programmed by the same computer, were giving us conflicting directions. To avoid argument we deferred to Rick's reading which sent us many miles off route past a town called Prescott. This turned out to be a blessing because the riders who stuck to the route ended up cooking in a traffic jam. Just before we arrived at Parker a strange thing happened. A lady who had heard about the rally had driven 200 miles south just to meet us at a gas station. I was torn between filling up and riding off or staying and talking to her and watching our times plummet. 22-mile straight - a novelty for an Englishman. I arrived in Parker in a miserable mood and spent the rest of the afternoon sulking because my hand really hurt by this point. 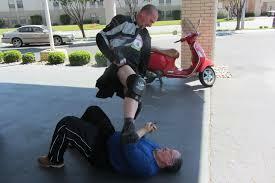 At this point I finally confided to Rick that I'd been riding with one hand for the past two days. The news wasn't well received. We left Parker early and after 110 miles, reached the Joshua Tree National Park. It's absolutely beautiful in a surface-of-the-moon kind of way and seems to go on forever. It's like a shallow valley filled with beautiful rock formations and oddly-shaped trees. The road was very disjointed - it was impossible to build up a rhythm and any kind of speed - only later did I realize that this was probably on purpose. The only truly scary moment came when we went over a level crossing and I went into what was basically a one-handed tank slapper. By some miracle I recovered it but there is a place that will be forever England quite close to that crossing. We'd arranged to meet up with a few local riders in Julian, California. As we'd arrived half an hour early we sped off guiltily to prevent our times dropping any further down the leader board, and headed on to San Diego. It was dual carriageway all the way into San Diego and we could feel the temperature dropping as we approached the coast. We arrived at the final destination, Motorsport Scooters, where a huge party had been laid on for all the Cannonballers. My rear tyre - a Pirelli GTS 24 - had by this time done about 3500 miles - was blistered and showing webbing. Even though there was a party going on the lovely people at Motorsport fitted a new one for me. After about an hour at the party, the adrenaline started to wear off. I'd done what I'd set out to do, and I really started to flag. 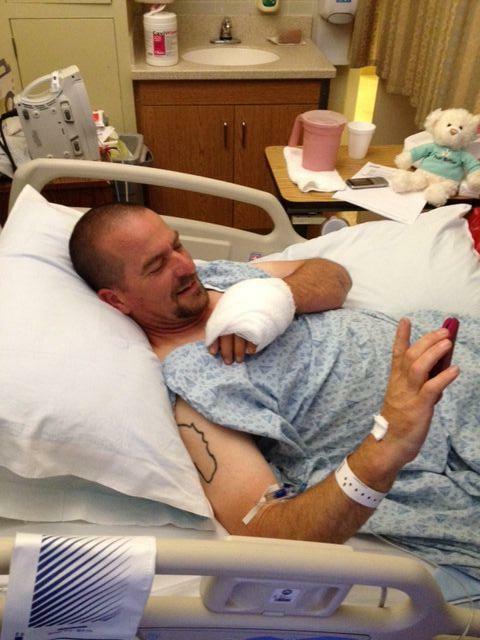 The plan had been to ride on to LA the next day, but our support truck driver, who has a medical background, took one look at my hand and ordered me straight to hospital. I'm glad he did because my now misdiagnosed spider bite turned out to be a serious MRSA infection that had festered in a warm glove for 8 days by this point. The infection had reached my right up to my elbow and my lymphatic glands were getting pretty sore so I was immediately put into quarantine and pumped full of IV antibiotics. 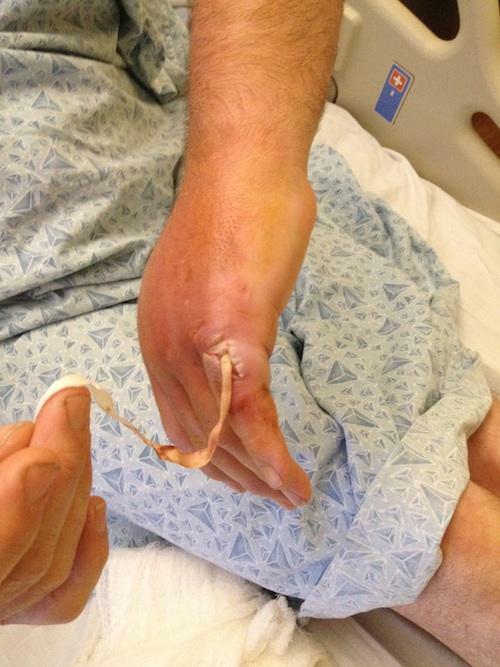 The highlight came the next day when a very nice doctor opened up my pinkie finger like an icing bag, drained about 20 ccs of pus out of my hand and inserted a wick to take care of the rest. By this time my scooter had been shipped to LA without me. When I was finally released from the hospital the next day my team mate and I proceeded to LA in a rental car - oh the humiliation. 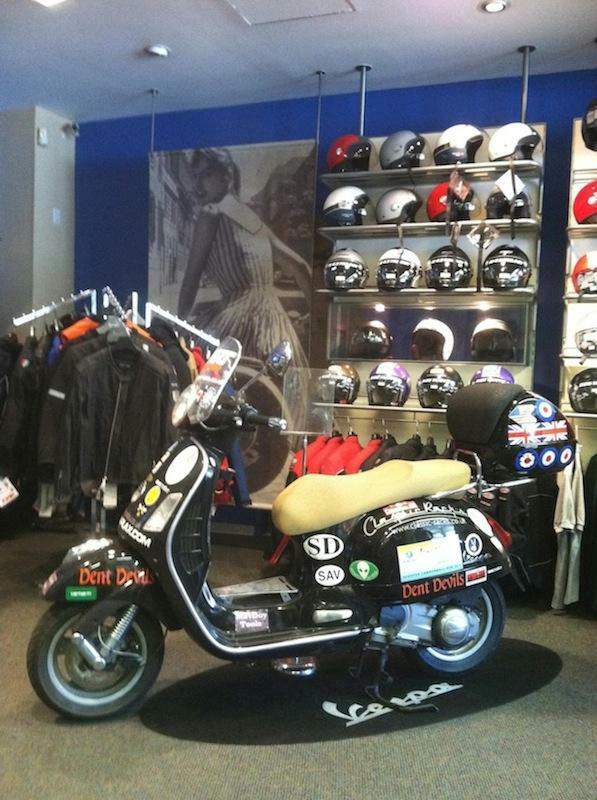 I spent the next three days convalescing, as a guest of Vespa Sherman Oaks, who had provided the scooter. The scooter - to Vespa's credit had been bulletproof the entire way. We finished 8th and 9th in raw times, and 18th and 19th after handicaps were taken into account. I raised £2400 for the charity. Because I didn't get the chance to do the last bit of the run into LA I feel like I've got unfinished business - so I'm already making plans for 2014. At first glance I'm tempted to think flipping heck, that's a long distance on an unsuitable machine but actually those modern large displacement scooters can fair clip on (as I found to my cost one evening trying to keep up with a Vespa GTS300i when I was on my FX650)! Yeah when we think scooter we think 50cc rev-n-rips that you got when you were 16. 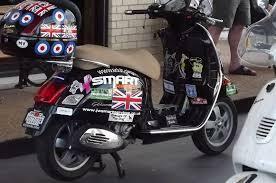 We've never really embraced the scooter here in the UK unlike say Italy and around the Med. Even BMW have a couple of large capacity Scoots but you'd be hard pushed to see one here in Blighty.